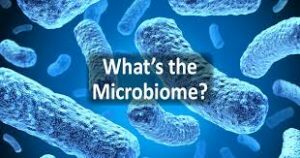 The microbiome is the full complement of the genes contained in all the microbes, tiny living single cell organisms, found throughout and inside the human body and the oldest form of life on earth. The human microbiome (all of our microbes’ genes) can be considered as complementary to the human genome (all of our genes). The genes in our microbiome outnumber the genes in our genome by about 100 to 1. DNA-sequencing tools help us to examine and identify the human microbiome more clearly than we could before, so that we can understand more about its benefits to our health and wellbeing. The field of epigenetics (epi- means above, or important than, the genetic code inside our cells) form a backdrop to understanding the symbiotic interaction between us and our microbiome. Microbes are everywhere. They’re found in air, soil, water, human bodies and all other living bodies and plants. They cover every surface of our bodies, inside and out. They’re on our skin, inside our noses, mouths, whole respiratory tract, plentiful in our digestive tract, reproductive system, and so on. These microscopic life forms consist of 1000’s of species and outnumber our own 50 trillion cells by about 10 to 1. Our endosymbiotic (endo- means living inside us in symbiosis, closely connected, to the benefit of both parties) microbiome can be considered as a newly discovered, still largely unexplored system, with numerous functions essential to human life. Very few microbes actually cause disease and in fact, many are essential for homeostasis (internal balance) important for good health. They are key to a healthy immune and digestive system. Even the mitochondria (the power generators inside every human cell that actually manufacture our bio fuel for energy), with its own DNA, were originally bacteria that have come to settle inside our cells in a purely symbiotic relationship, eons ago! As a society we have become too clean, overly conscious of hygiene! For example, forgetting that babies do require some exposure to various organisms to develop immunity, we oversterilise their bottles and toys, thereby killing the beneficial flora or microbes, leading to Candida overgrowth (thrush). We also misuse antibiotics, killing our own microbiome, once again causing overgrowth of Candida leading to yeast infection. Candida albicans is also a normal part of our microbiome, but needs to be kept in check, and in balance by our innate intestinal flora or gut microbes. Antibiotics (meaning against life) kill our normal flora, leaving all viruses flourishing, while disturbing our inner balance and immune system health. Many of our modern, Western diseases have to do with nutritional deficiencies (from the wrong food choices we make) and autoimmune disease where the white blood cells of our bodies attack its own cells. More and more research show the possible connections to the human microbiome, dysbiosis (microbial imbalances) and chronic diseases. These include arthritis, gum disease, obesity and cardiovascular (heart and blood vessel) disease – all of which has renegade inflammation at its core. Of course, inflammatory bowel disease (IBD), from irritable bowel syndrome (IBS or spastic colon), to Crohn’s disease and ulcerative colitis (regarded as autoimmune diseases), as well as their symptoms, including persistent and painful diarrhea, stomach cramps and food intolerances, are directly linked to dysbiosis inside the digestive tract. There is some evidence to connect IBD to immunity-related genes, but what’s the trigger? Evidence is pointing to the microbiome and imbalance in gut microbes as well as an imbalance in lifestyle, with chronically high levels of stress. Instead of crippling immune systems with immunosuppressive drugs, I recommend prescribing an improved set of bugs (gut microbes or probiotics) to patients with IBD! Billions of microorganisms live on and inside us (our microbiome). Most are beneficial, with only some potential pathogens. The beneficial ones are called probiotic microorganisms. 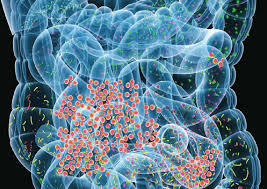 Lactobacillus acidophilus bacteria reside mostly in the small intestine, and Bifidobacterium bifidum are found in the large intestine (colon). Probiotics improve the environment of the intestinal tract. The regular use of probiotics is important in healing many chronic gastrointestinal problems and allergies. Some experts feel that children with allergic tendencies, need several times the amount of probiotics than those without GI problems, due to the frequency of dysbiosis (overgrowth of yeast, bacteria, etc.) and ‘leaky gut syndrome’ (increased intestinal permeability). Examples of wellknown probiotics include Saccharomyces boulardii, Lactobacillus acidodiphilus and Bifidobacterium bifidus, to restore normal gut flora, improve immune system function and assist in digestion and absorption of food. Also helpful are the pre-biotics, inulin and fructo-oligosaccharides (or FOS, found in artichokes, onions, garlic, bananas, specific supplements). FOS and inulin are non-digestible oligosaccharides that help promote the growth and activity of friendly bacteria in the intestinal tract. These are called ‘pre-biotics’ because they are thought to help promote probiotic colonisation and growth. These oligosaccharides are non-caloric compounds that cannot be broken down by our digestive enzymes and therefore do not adversely affect blood sugar levels. Research has shown that both FOS and inulin enhance the growth of lactic bacteria, especially Bifidobacteria, and inhibit the growth of a variety of undesirable organisms. Scientific studies over the last 50 years show that probiotic organisms can improve the nutritional quality of foods, produce natural antibiotics, anti-carcinogens, and substances that break down and assist in secretion of toxins inside their human host. Digestive enzymes are also very helpful in restoring balance to the intestinal flora population. These can be found in supplement combinations containing pancreatic enzymes (amylase, protease, sucrase, malt diastase, lipase, cellulose, lactase), papain form paw-paw, bromelain from pineapple stem and cultured moulds from Aspergillus species. Probiotics are helpful in restoring balance inside the digestive system. If anyone does need an antibiotic for severe bacterial infection (e.g. pneumonia or meningitis) or suffer from any allergies, be sure to include probiotics to improve gut and immune system health. Fresh ginger (20cm size crushed) and peppermint leaves (about 10, crushed), steeped in hot water, will help for nausea. Take it 15 minutes before meals to improve digestion. Fresh ginger (20cm size crushed) and peppermint leaves (about 10, crushed), steeped in hot water, will help for nausea. Take it 15 minutes before meals to improve digestion. The homoeopathic remedy Nux vomica will also help for nausea. Mastic gum destroys H. pylori, the bacteria often responsible for stomach ulcers. It also helps treat intestinal cramps, indigestion and heartburn and counteracts the damage done to the gastric mucosa caused by, anti-inflammatories and other prescription medicine. Base Powder contains calcium and magnesium as well as other minerals and effectively reduces stomach acid and relieves the symptoms of heartburn. Aloe vera juice aids in pain relief. Bromelain (250mg 3x daily) is a digestive enzyme that helps improve digestion and relieves symptoms while Omega 3 & 6 protects the stomach lining and duodenum and can prevent ulcers. Our microbiome has been studied for its many health benefits. Chocolate being a good example! Our intestinal flora make antioxidants in cocoa available for our bodies to use. A meta-analysis of 20 research papers showed a marked drop in blood pressure in those who consumed dark chocolate or cocoa daily. This is a direct result of the fermentation and further digestion of the beneficial compounds found in the cocoa bean, made possible by our microbiome. Detoxification & purification: essential for a healthy mind and healthy body! We have all experienced the need and desire to cleanse and purify our bodies and rid ourselves of accumulated waste. This instinct is as old as humankind itself. Throughout history people have undergone various cleansing rituals to purify their minds and bodies of negative emotions and physical waste. This restores gut health (microbiome in balance), immune system health and ensures longevity. Hot baths, steam baths and periods of fasting help to rid the body of toxins. In addition, herbs, food supplements and a wholesome diet will help to complete and maintain the process of detoxification. Drink at least eight glasses of water and at least three cups of a cleansing herbal tea mixture every day. Make an infusion of one teaspoon of dried herbs or two teaspoons of fresh herbs in boiling water and drink it as a tea. Use any of the following herbs on their own or in combination: dandelion, fennel, rosemary, cinnamon, ginger, turmeric or milk thistle, or of course, Kumbuchu! Herbs support the liver, lymphatic system, urinary tract, skin and intestinal canal to get rid of toxins. Add a teaspoon of honey if you like. Follow a healthy wholesome and balanced diet. Remember the fresh fruit and vegetables with enough greens, wholegrain products, beans, seeds, pulses and nuts (organically grown if possible). Use garlic, onion, ginger and some of the herbs listed above to prepare tasty and healthy food. Eat plenty of broccoli, cabbage, dark leafy greens, tomatoes and pawpaws. Avoid preservatives, pesticides and chemicals in foods as far as possible. Use monounsaturated fats and unsaturated fats such as olive oil, coconut, grape seed oil, flax or linseed oil in moderation (3 tablespoons per day) in food preparation and salad dressings. Avoid fried foods, white sugar, white flour, saturated and transfatty acids (such as animal fats and block margarine). Beware of excessive intake of caffeine and alcohol and avoid unnecessary medication as far as possible. Increase your intake of fibre by sprinkling psyllium seeds, linseeds or bran over your porridge or adding them to salads or food every day. Eat oatmeal porridge. If you take psyllium seeds or linseeds on their own, drink at least one glass of water as well. Try to fast for one day a week. A Monday is usually a good idea, but any day will do. Drink at least 12 glasses of water, above herbal teas and fruit juices such as apple or grape juice. If you get very hungry, eat an apple or a bunch of grapes. Fasting once a week does wonders for your health and state of mind – and to delay the ageing process. People who suffer from diabetes, other serious diseases and pregnant women should consult their doctors before fasting. Most people can afford to give their digestive tract and metabolism a break one day a week to restore the balance in the microbiome! Try to exercise for 15 minutes every day or for 20-30 minutes three or four times a week. It is not necessary to exhaust yourself. A quick walk outdoors, doing dance routines on the lounge carpet or a few lengths in the swimming pool are quite enough. Choose an activity that you enjoy. Finish your exercise session with relaxation exercises. Yoga refreshes your body, give you energy and strength and calm your mind and soul. Treat yourself to a steam bath once a week. Put five cups of Epsom salts in bathwater as hot as you can stand or have a sauna at the gym. Drink plenty of water or herbal tea while you sweat out your toxins. Increase the population of ‘friendly’ bacteria in your intestines by eating asparagus (fructo-oligosaccharides), fresh, full cream yoghurt with live AB cultures, or taking the friendly bacteria in food supplement form: Saccahromyces, Lactobacillus, Bifidobacterium are good examples. The most important thing in all our lives is to realise that there must be a balance in our gut bacteria or flora (microbiome), but also in mind, body and soul!